Civic groups are said to be the fount of democracy, but these vivid portraits of American life reveal an intriguing culture of political avoidance. Nina Eliasoph accompanied volunteers, activists and recreation club members, listening to them talk--and not talk--politics, in a range of private and public settings. 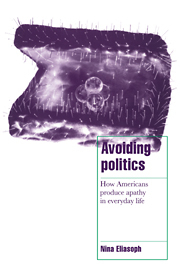 Unlike interview-based studies of political participation and civic culture, Avoiding Politics shows how citizens create and communicate political ideas in everyday life, and the hard work it takes to produce apathy in a democracy. Acknowledgements; 1. The mysterious shrinking circle of concern; 2. Volunteers trying to make sense of the world; 3. 'Close to home' and 'for the children': trying really hard not to care; 4. Humour, nostalgia and commercial culture in the postmodern public sphere; 5. Creating ignorance and memorizing facts: how Buffaloes understood politics; 6. Strenuous disengagement and cynical chic solidarity; 7. Activists carving out a place in the public sphere for discussion; 8. Newspapers in the cycle of political evaporation; 9. The evaporation of politics in the US public sphere; Appendices; Notes; References; Index.